The patent-pending Rain Gauge optical design keeps the beams inside the sensor, away from the influences of falling leaves and spiderwebs. The RG-11 detects the surface condition, caused by dirt, contaminants, aging, and other factors. It properly compensates the data, making the device virtually impervious to environmental factors. Sophisticated software gathers data from individual raindrops and implements a proper control strategy for the selected mode. 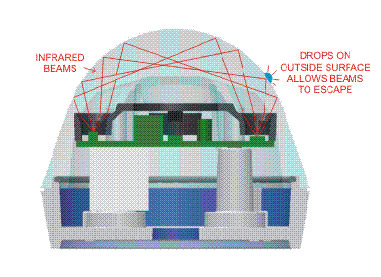 The system can detect individual drops of under half a millimeter. The tipping-bucket emulation algorithm can register accumulations of just one ten-thousands of an inch– a hundred times more sensitive than a typical tipping bucket. The RG-11 borrows technology that was developed over many years for automotive rain sensing windshield wiper controls. We can offer the RG-11 at such a righteous price because the development was largely paid for through our research in the automotive field. See the RG-11 instructions for information about how the RG-11 responds in the different modes. But don’t worry about the complexity of the Rain Gauge. Think of it as a functional block that encapsulates the rain sensing function for you– reliably, low maintenance, and at a low cost. 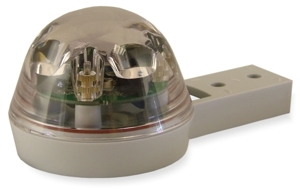 The perfect Rain Sensor for your application. 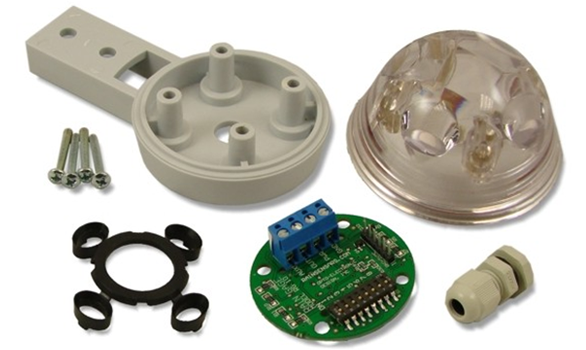 Most of the complexity of the RG-11 is in the software and injection-molded optics. Sophisticated, but inexpensive to produce. RG-11 Optical Rain Sensor / Rain Gauge. Rugged, sensitive and low maintenance.